Thank you to all our Great Hatch 2019 winners! The Great Hatch 2019 Grand Prize Award went to Tractus, a mechanical traction device to achieved desired and sustained level of fracture site distraction for distal radius fractures. 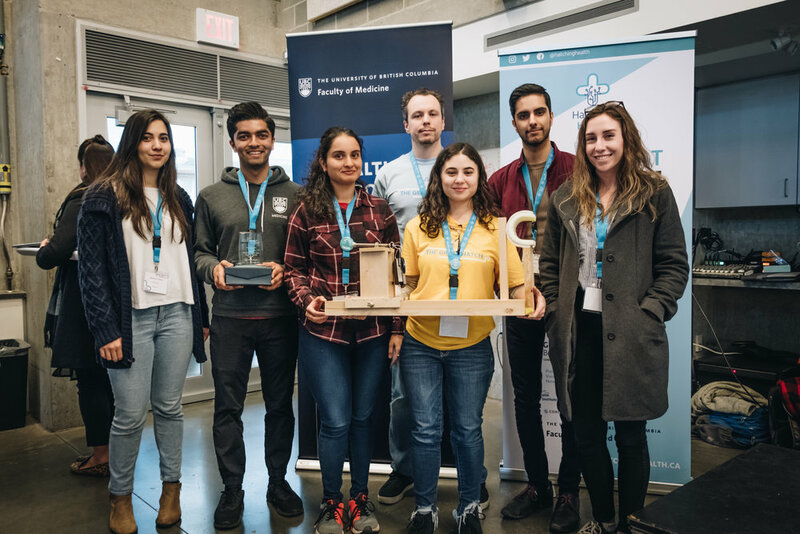 The UBC Faculty of Applied Science Award for Best Technical Innovation went to H4ptic, a non-invasive device that captures and transmits haptic sensation from a prosthetic limb to the user. The UBC Faculty of Medicine Catalyst Award for Interdisciplinary Collaboration went to ASAP Suction, a suction tool that allows for simultaneous suctioning and breathing tube placement in emergency intubation situations. The Joule Healthcare Innovation Award for Biggest Potential Impact went to DeMAR, which leverages Near-field communication (NFC) technology to empower the homeless population with their personal health information to improve coordination, continuity and quality of care they receive when interacting with the healthcare system. The GenomeBC Omix Award for Impact went to QuickER, an app that reduces overcrowding and long wait times at hospital emergency departments by redirecting non-urgent patients to nearby walk-in clinics.